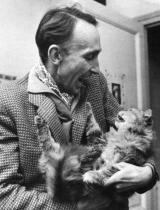 It should be noted that Bazin died at the age of forty and death stalked him continuously throughout his life. Bazin’s attraction to realism, and an idea of art as a production of the eternal, seems inherently linked to his psychological and physiological state. The attempt to cheat or outlast death through the preservation of one’s image and world seems very close to Bazin. As Bazin explains ‘the image helps us to remember the subject and to preserve him from a second spiritual death’.5Just like F. Kafka’s fiction, which is infused with fears of and struggles with consumption, Bazin’s conception of the psychology of the plastic arts seems to be his own.6 That said the foundation of much art is linked to attempts at ensuring an ever-lasting legacy. From statues, palaces, portraits to tombs influential men have commissioned and produced art to represent themselves and the world they live in. The painter is unable, due to his medium, to escape the appearance of his touch. Photography, according to Bazin, evaporates the human touch: photography removes the artist’s fingerprint evident in the medium of painting and sculpture. Bazin also believes that, because of the technical and scientific method of photography, the aesthetic experience derived is much more in-line with personal perception. Photography and cinema replicates the physically real without the barrier that one encounters when admiring a painting or sculpture. It should be noted however that Bazin invests far too much faith in the technical process of developing film as an objective and not subjective process. The production of film is open to that very same human touch Bazin felt paintings contained. With the birth of photography came the birth of photo modification and editing and films such as The Cabinet of Dr. Caligari show this trend with certain scenes being coloured differently. And with digital film it is hard to really locate an image that hasn’t been altered somewhat for aesthetic reasons. I think Bazin, even if he accepted that film is often modified, would argue that the best cinema would attempt to capture reality as it is. However this position will be further explored in Bazin’s other essays and other articles concerning them. Bazin may have argued, however, that the counter-position – that photography is not objective – incorrectly translates his proper position. Bazin uses the French word objectif, which means the lens of a camera, and overtly, in the French text, plays on this meaning. Bazin may therefore be arguing that by the objective nature of photography he means that the physical appearance of brush marks, the fingerprint of the human touch, are not apparent in film and therefore photography, unlike painting or sculpture, reproduces “reality” without direct reference to an artist or photographer. Bazin therefore may not mean objective as not-subjective but rather “through an object”. Photography removes the appearance of the touch of humanity rather than the touch of humanity. To Bazin the process of photography ‘confers on [an object] a quality of credibility’.10Bazin explains that we ‘accept as real the existence of the object reproduced, actually re-presented, set before us, that is to say, in time and space’.11Bazin is arguing that photography and cinema communicates an items existence to us and we believe it. A point is often made here that Bazin seems to believe in the naïve position that “the camera never lies”. However I believe that this point is too harsh. Bazin uses the word ‘confers’ which indicates Bazin’s position to be that the sense of real is attached or attributed to the image – this is not the same as saying “the camera never lies”. Bazin is arguing that the reproduction of reality, through the camera, is imbued with an advantage because, unlike a painting or sculpture, a photograph is not an ‘ersatz’.12Painting, or sculpture, is a replacement for an object, a photograph the reproduction. And Bazin believes that this reproduction is treated, commonly, as if it is the object. There does seem to be some truth to Bazin’s position. People often accept cinematic worlds without question and often photos modified, or “photo-shopped”, are accepted as true and real until people are promoted to believe otherwise – Piers Morgan losing his job over now discredited Iraq photos is a distinct instance of this. This common, or regular, acceptance of photography and films’ realism is often targeted by “viral” marketing campaigns and I am reminded of a film – whose name I currently can’t remember – which circulated a simulated, but realistic looking, office fight in order to gain surprise and attract people unknowingly towards the film’s website. It is not that “the camera never lies” but rather that we often accept photographs and films’ visual representation to be unadulterated and true (even though we known it isn’t – a psychological state known as ambivalence). To Bazin photography makes us see the world anew. Realism strips bare those preconceptions which, to Bazin, we accumulate through the passage of time like dust settling on furniture. Therefore to Bazin photography and Cinema, in the realist style, is a gust of wind which blows away the dust that settles on our way of seeing. A problem with Bazin’s conclusion, that realism blows away our preconceptions, is that it moves from explanation to conclusion without exploration of the logical sequence which would indicate how realism would blow away our preconception. Bazin imbues the realist style, and photography, with magical qualities like the ones he noted in the Egyptian cultures motivation for mummification. However Bazin fails to establish the reason why and how the realist style blows away the dust of preconceptions and it seems rather, contradictory to Bazin’s intended position, that realism relies on preconceptions. Realism is not so much presenting ‘virginal purity’ but rather relying on regular conceptions and perceptions of reality – this reliance is in fact why one would argue realism is imbued with the power of truth. Realism encounters a problem as it seems to rely on “common-sense” perceptions – and those “common-sense” perceptions tend to be a naturalised ideological position.15In ‘The Ontology of the Photographic Image’ Bazin cannot support the conclusion he comes to however he does provide a groundwork for arguing that the film is a powerful medium with a technical process of production which allows it to represent an object rather than replace it – which painting and sculpture does – therefore ensuring a sense of verisimilitude to attached to the medium of film. Bazin does go on to argue for realism in further essays and I will cover these in the attempt to uncover his motivation for his assertion that realism is the optimum style of film. 1‘The ontology of the photographic image’ is an inquiry and assertion by Bazin on the differences between film, and painting/Sculpture. On a wider note Bazin’s ‘ontological’ approach is an inquiry into “what is”, “could be” – and most important to Bazin’s What is Cinema? – and “what should be” in cinema. 2Andre Bazin ‘The Ontology of the Photographic Image’ in Andre Bazin, Hugh Gray (trans), What Is Cinema?, Vol. 1, London: University of California Press Ltd, (1967), pp. 9-16, p. 9. 3Andre Bazin ‘The Ontology of the Photographic Image’, p. 10. 4Andre Bazin ‘The Ontology of the Photographic Image’, p. 10. 5Andre Bazin ‘The Ontology of the Photographic Image’, p. 10. 6 It should be noted that, although it is evident that Kafka’s fiction is imbued with the personal fear of death and his physical state, there is great humor and joy even in the struggle and fear. 7Andre Bazin ‘The Ontology of the Photographic Image’, p. 11. 8Andre Bazin ‘The Ontology of the Photographic Image’, p. 12. 9Andre Bazin ‘The Ontology of the Photographic Image’, pp. 12-13. 10Andre Bazin ‘The Ontology of the Photographic Image’, p. 13. 11Andre Bazin ‘The Ontology of the Photographic Image’, pp. 13-14. 12Andre Bazin ‘The Ontology of the Photographic Image’, p. 14. 13Andre Bazin ‘The Ontology of the Photographic Image’, p. 15. 14Andre Bazin ‘The Ontology of the Photographic Image’, p. 15. This article continues on from my earlier post: The Debt to, and Divergences from, Hollywood Cinema in Jean-Luc Godard’s A Bout de Souffle and Juzo Itami’s Tampopo. I have decided to produce a full range of reviews and analysis’s of non-Hollywood film. As the title indicates I will start with the brilliant Stray Dog. Akira Kurosawa’s film contains both allusions to and major differences from Hollywood cinema. One major divergence is the disturbance of graphical clarity. A common aspect of the continuity editing system graphical clarity ensures that the mediating nature of film and the camera are allowed to remain hidden and unacknowledged. 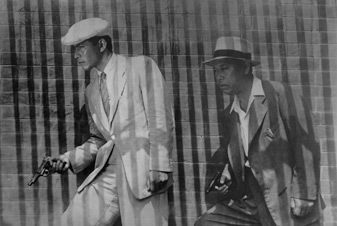 Kurosawa’s Stray Dog disrupts clear graphical construction in a scene by filming through a beaded doorway, therefore creating a disrupted and blocked view of the film’s two main protagonists. In the continuity editing system ‘the camera remains relatively unobtrusive, seldom drawing attention to its mediating presence.’ (1) to facilitate this unobtrusive camera style directors’ choose clear and unobstructed views of action which won’t draw attention to the fact that we are watching a film. Even if a director chooses an obstructed view we tend to be given a subjective position, one that does not bring attention to the fact that the screens’ images are mediated through a cameraman. If we are given an obstructed view we are given a reason behind the blocked view. 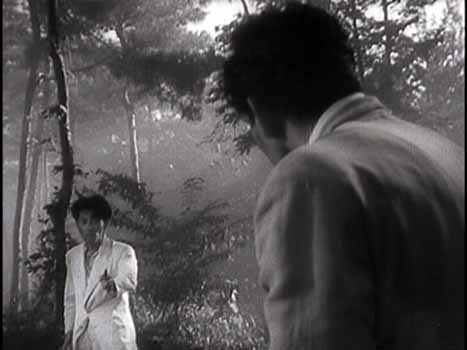 The collection of conventions concerning graphical clarity are contradicted in Kurosawa’s Stray Dog. Because we are viewing the action through a beaded doorway we notice our disadvantaged position; we notice how hindered and disrupted our view is and we are offered no reason why we should view from this particular angle. We become conscious of the mediating force that is cinematography. Kurosawa uses this to remind us of the conventions of cinema. Kurosawa uses the technique to disturb our position of knowledge by inferring that all we can perceive is that which the camera, and director, wishes to. Our experience is defined by the mediating force in the same way the characters are defined by what they see. Kurosawa seems to be highlighting this because experience and subjective perception is important in the narrative of Det. Murakawi, both as he learns from the sage Det. Sato and in the revelation of his own similar experiences to the antagonist Shinjiro Yusa; the man with Murakawi’s gun committing the crimes that rack Murakawi with guilt. 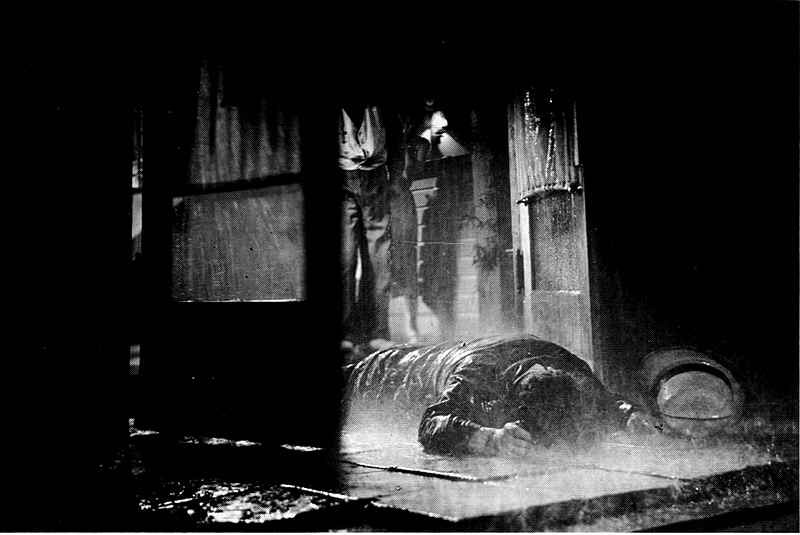 Akira Kurosawa’s Stray Dog alludes to the Hollywood cinematic forms of Film Noir and the Gangster Film. In one scene a villain, Honda, is called to a front gate of a Baseball stadium by a tannoy system. As he walks down a flight of stairs the screen composition changes and the lighting produces a dark Noir-like affect. Honda, dressed similar to many an archetypal gangster, enters the scene in a normal naturalistic light, however the further he descends down the stairs the further Akira Kurosawa intensifies the sharp contrasting tones producing a chiaroscuro-style scene. Honda wears a white linen pin-stripe suit, as he becomes aware he may be walking into a trap the Camera reverses position and shows only a black silhouette of Honda enveloped by the darkness; his fate is sealed, his relationship with the gun-girl leads to the police locating him, just like many gangster films and film Noirs Honda’s cool command and apparent invincibility is breached through a contaminated relationship with a woman. Honda is a small homage to the doomed antagonist/protagonist of the Noir and gangster films of Hollywood. 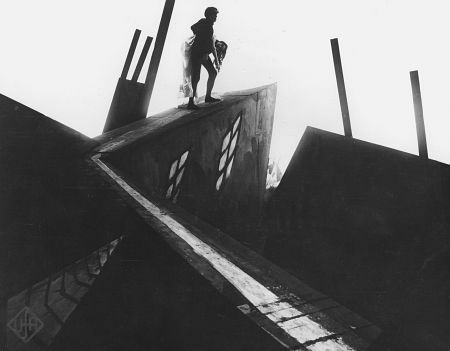 The skilful use of lighting in this scene is also an allusion to German Expressionism and the stark contrast between subject and surroundings symbolised by Honda’s change from white linen suit to dark silhouette is a typical chiaroscuro technique found in films such as The Cabinet of Dr. Caligari(1920). 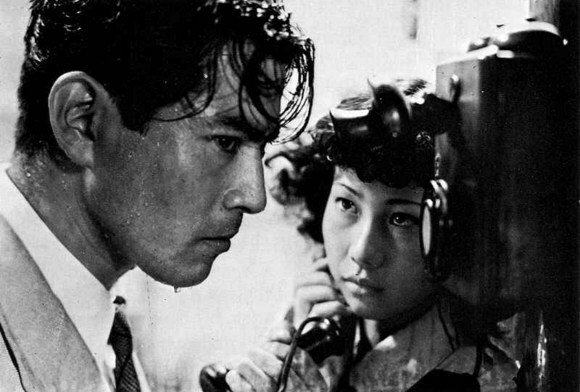 Paul Schrader notes that a common trait of Film Noir is the use of ‘Shadow effects [which are] unlike the famous Warner Brother’s lighting of the thirties in which the central character was accentuated by a heavy shadow; in Film Noir the central character is likely to be standing in the shadow.’ (2) Kurosawa is using this exact technique in the scene with Honda, he is defining Honda’s character and fate as one in the shadows. Another allusion to Film Noir stylistics is the use of water. Film Noir is noted for an ‘attachment to water. The empty Noir streets are almost always glistening with fresh evening rain… and the rainfall always seems to increase in proportion to the drama.’ (3) As the film moves to a conclusion rain starts to pelt down relentlessly, The rain increases as the potential confrontation between Murakami and the desperate thief Shinjuro Yusa becomes more and more likely and it is in fact the rain, and the mud that sprays onto Yusa’s trousers as he flees after shooting Sato, that allows the confrontation and eventual capture of Yusa. Akira Kurosawa’s Stray Dog both alludes to Hollywood cinematic genres and contains major divergences from the Continuity System. In this aspect Akira creates a film that contains both national elements of note and internationally recognizable symbols and allusions and therefore Akira has created a brilliant film. 1. Richard Maltby, Hollywood Cinema, Oxford: Blackwell Publishing, (2003), p. 312. 2. Paul Schrader,’Notes On Film Noir’ in Barry Keith Grant, Film Genre Reader II, Austin: University of Texas Press, (1999) pp. 213-226 p. 219. 3. Paul Schrader, ‘Notes On Film Noir’, p. 220.